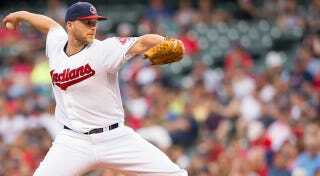 During the fourth inning of last night's game between the Red Sox and Indians, Justin Masterson did something that is pretty damn incredible: he struck out the side on just nine pitches. It was as perfect an inning as a pitcher can possibly have. 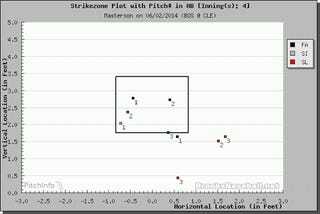 Masterson's first victim was Jonny Gomes, whom he dispatched with a perfect fastball-slider-slider combination. The first-pitch fastball was a called strike on the outside corner, and Gomes finished the at-bat by flailing at two nasty sliders that went diving out of the zone. Grady Sizemore was up next, and all he could do was watch Masterson's first-pitch sinker get called a strike, foul off a high fastball, and then wave helplessly at slider that went sweeping toward his feet. Masterson started off the next batter, Stephen Drew, with a fat fastball that was probably the most hittable pitch of the inning, but Drew just watched it sail by for a strike. Then came a backdoor slider that froze Drew in his place, followed by another slider that he couldn't quite check his swing on. The fastballs to Drew and Sizemore were the most hittable of that bunch, but that's a nasty collection of pitches—look at those sliders!—for three hitters to have to deal with in an inning. Oddly enough, this is already the third immaculate inning that has been pitched in the majors this year. Cole Hamels did it in the third inning of a game against the Reds on May 17, and Rays reliever Brad Boxberger did in in the sixth inning against the Royals on May 8. The most immaculate innings to have been pitched in a single season thus far is four. They were put together by Jason Isinringhausen, Byung-Hyun Kim, Pedro Martinez, and Brian Lawrence in 2002. Given how many great pitchers are currently doing their thing in the majors, it seems like that record is about to be broken.